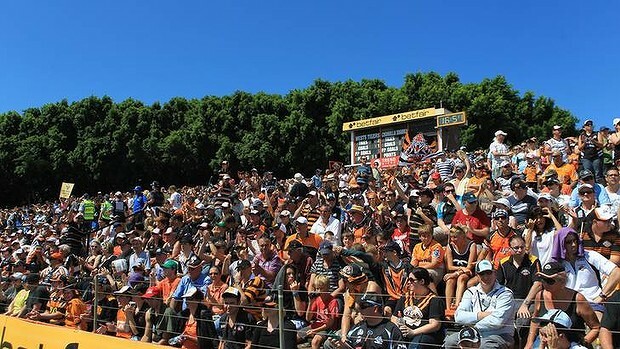 THE sight of more than 16,000 fans crammed into a soggy and bedraggled Leichhardt Oval in early April confirmed that Sydney is essentially a tribal city. Despite an antiquated scoreboard, access via 19th century laneways and a lack of toilets – along with atrocious weather – they came in their droves to watch the home team score an upset. The big crowd was not just relevant to the debate about funding for local sporting venues. It also helped inform the debate about how we plan our city. The Leichhardt experience shows that we love our local experiences and community. Despite the internet age where physical boundaries are supposedly rendered meaningless, we actually do strongly connect with our local tribe. There’s a distinct and unique character to most of Sydney’s sub-regions. I came from the St George region – a place known for its multiculturalism and a rugby league team with pedigree. Cross the Georges River and move into the Sutherland Shire and you’re definitely entering the territory of a new tribe with different values. This fierce localism however means it has been difficult to get all the tribes to agree and implement a common planning vision for Sydney. Who gets the housing and jobs growth, what infrastructure is needed and what united image do we project to the rest of the world – these are not easy questions to answer. Our tribalism is probably behind the fact we have more than 40 councils across the metropolitan area and a strong culture of resident activism. On April 11, the Committee for Sydney organised a discussion led by London-based city planning expert Greg Clark (sponsored by my employer KJA) who stated that Sydney needed this common planning vision. Clark has been an advisor for 20 cities across five continents. He pointed out that, whether it liked it or not, Sydney was in competition with other cities for business and a metropolitan-wide planning approach was essential for success. He said other cities were far more organised when it came to adopting a metropolitan-wide approach to planning – the closest examples being Melbourne and Brisbane – and that these cities had a far clearer brand and image than Sydney. Evidence last week that Melbourne is set to over-take Sydney as Australia’s largest city as early as the 2030s would appear to prove that point. Clark put Melbourne alongside cities such as Barcelona, Zurich, Stockholm, Vancouver and Amsterdam which have a truly “metropolis” focus. Sydney, he says, is in the naughty corner for not properly focussing on this task, sitting alongside cities such as Vienna, Milan, Berlin, Atlanta, Bogota and Toronto. Perhaps it is no surprise Melbourne is perceived to have a stronger metropolitan-wide focus. While Sydney clings on to its local grounds, Melbournians have been happy to abandon local sporting grounds for large metropolitan venues in the city centre. And Brisbane has had a single local council since 1924 (when 20 councils were amalgamated). Clark said it wasn’t clear to him whether Sydney wanted to attract people and business as a result of its environment and lifestyle (including its open space) or because it was a hustling, bustling global centre of activity. He said in a city the size of Sydney it was difficult to do both. Clark also stated that, in other cities which had transformed themselves into metropolitan powerhouses – in particular London, Hong Kong and Barcelona – it had been the business community which had led the debate for a new citywide planning approach, rather than politicians. He said business leadership in this issue was usually warmly received by government, because businesses were seen as taxpayers and therefore valued customers. He said politicians usually participated in this approach, but business had led it. And importantly, he said new government frameworks may not be the immediate answer. He said getting government authorities to have a commitment to, and culture of, working together was usually the first part of a cycle to reform a city, with the creation of new governing institutions usually coming later than this. Which brings us back to the tribes of Sydney. Does metropolitan-wide governance mean an end to the tribal approach in Sydney – where every tribe controls a local area? Or does it in fact mean that the tribes need to start working together – really for the first time in Sydney’s history. Or do we need to extinguish tribalism and localism altogether – in other words discard it like a redundant leftover from feudal times which has no relevance in the modern age? You’d have to think we need to at the least begin a conversation with the tribes to move towards more effective metropolitan-wide planning. The tribal nature of Sydney – and its localism – is part of its charm and attraction. But is this how the city should be planned in coming decades? Part of conversation probably needs to include some re-assurance that metropolitan-wide planning needs to maintain or improve the lot of the tribes. That includes illustrating that big city planning can lead to local benefits, including improved local and State infrastructure, easier access to housing and jobs, traffic and parking answers and some respect for local character. Otherwise two or more tribes might go to war. ← Pop-up shops: are they the solution or problem?